Susan Bourdet’s luminous watercolors combine realistically detailed birds and animals with soft, impressionistic backgrounds, a technique that has evolved through her many years of painting. Watercolor is ideally suited for nature paintings because it works well for detail, but it is the spontaneous, fluid aspect of watercolor that Susan finds most expressive. Much of her work is created with the watercolor paper soaking wet, allowing the pigments to blend and flow without edges. While the realistic parts of the painting accurately describe the subject, the free-flowing backgrounds are all about color and intensity which imply rather than describe background shapes. The viewer’s imagination is then involved in discerning the image. For many years, through college and beyond, Susan struggled to combine her two great loves - art and biology. When her two children were small, she began to do ink illustrations for the Portland zoo newsletter, then learned to incorporate watercolor and full backgrounds. Her paintings were discovered in a Portland gallery by Wild Wings, which has published her limited editions for twenty years. Her work is also internationally presented in three calendar titles published annually by Lang. Her original paintings can be found in collections worldwide and have been featured in shows and exhibitions all over the country, including the Leigh Yawkey Woodson Art Museum's Birds in Art and the Society of Animal Artists' Art and the Animal. Susan enjoys sharing her unique methods and insights in workshops. She has authored two Northlight instructional books on watercolor, Painting the Allure of Nature and Capturing the Magic of Light. She has also been featured in two Creative Catalyst instructional videos - Bold and Beautiful and Capturing Backyard Wildlife in Watercolor. Susan’s travels to favorite wild places fuel her imagination, but her work most often reflects the vibrant beauty and abundant bird life of the Pacific Northwest. Avid gardeners, she and her husband have created a backyard oasis for migratory songbirds, complete with a waterfall, pond and lush woodland. Each season brings new perspective and different birds to offer never-ending inspiration. “Capturing” birds, which are never still for long, requires many hours in the field with the camera and telephoto lens. The resulting photos rarely catch the subject in focus or in a good setting, but may catch the pose and the light that is the basis for a painting. The next challenge is to create a believable environment for the subject. Often Susan places the bird among garden flowers or realistically rendered wild plants, and she loves to find the weathered textures of rock, old wood and bark to contrast with the softness of feathers and petals. 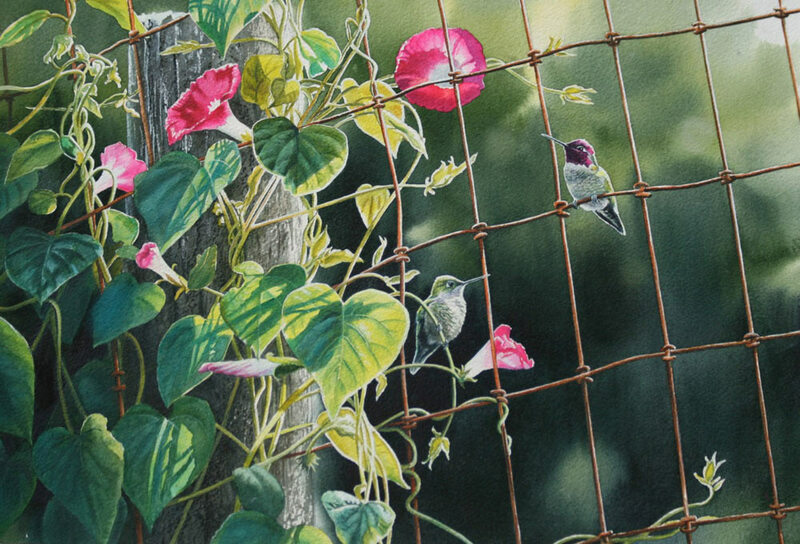 In these watercolors you will find a reflection of Susan’s love of life, and an effort to capture a fleeting moment of sunlight and shadow in the natural world.